CAPE CANAVERAL, Fla. — Tucked amid the other gear inside the cargo bay of NASA's last space shuttle to fly will be a novel experiment: a robot gas station for spacecraft that, if successful, could change how satellites are designed. Normally, when a satellite is launched into orbit it, is already carrying all the fuel for its entire mission onboard. Once that fuel runs out, the satellite's life is effectively over. That fact makes it tough for old satellites — as well as craft launched into the wrong orbit and ones that suffer a malfunction — to keep working. But this new in-space refueling project could change things. Developed by NASA's Goddard Space Flight Center in Greenbelt, Md., the Robotic Refueling Mission experiment will include a set of tools that could not only gas up satellites in space, but also perform minor repairs. This system's first test will be performed on the space station using the orbiting lab's Canadian-built Dextre robot to check its feasibility. The refueling test hardware includes simulated caps, valves, external thermal blankets and ethanol fuel, experiment designers said. 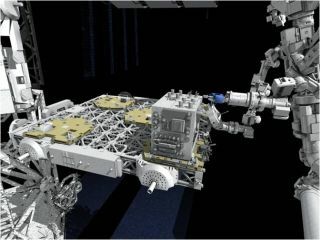 It will be the Dextre robot's job to use its own set of specialized tools to try to access the refueling systems, officials added. Yet, on most satellites, similar valves and other equipment were never designed to be touched in space. "Due to how these satellites were initially assembled, the nature of this mission is very complex," said Benjamin Reed, NASA's deputy project manager of the Space Servicing Capabilities Project. "If this works out, whenever a satellite goes through this process, not only will it be refueled, it will also be modified so that now it can be refueled more readily." If the system works as expected, the first actual mission to repair a satellite running low on fuel is scheduled for May 2013, NASA officials said. But that wouldn't be just another test flight; it would include a trip to visit a weather satellite slated to be decommissioned, they added. For Atlantis' launch, the Robotic Refueling Mission hardware will be attached to a shelf-like external cargo platform in the shuttle's payload bay. Several other large spare parts for the space station will also ride along. "We incorporated into this flight an additional stowage kit that allows us to have an additional 400 pounds of cargo bags around the ascent cone," said Mike Kinslow, payload flow manager for the Atlantis mission. "The other big change that was done was, a modification package was added to strengthen the racks so that we could add additional cargo bags close to the floor. This increased what each of these racks could carry by 200 pounds." Atlantis is currently scheduled to launch on July 8 at 11:40 a.m. EDT. The shuttle's crew is made up entirely of veteran astronauts, including commander Chris Ferguson, pilot Doug Hurley and mission specialists Sandra Magnus and Rex Walheim. NASA is retiring its three-shuttle fleet to make way for a new space exploration program aimed at landing astronauts on an asteroid by 2025. After the upcoming mission, Atlantis and its sister ships will be moved to museums for permanent public display.